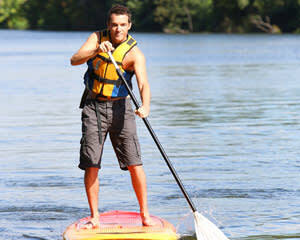 A top pick among Orlando's many water sports is the breathe-easy stand up paddle board. If you’ve never stepped foot on a SUP before, don’t worry—with a little practice you’ll be assuming the ready position, keeping upright and mastering the strokes like it’s nothing. You’ll even be offered a private lesson that doesn’t cut into your paddling time. It’s the perfect outing on a sunny afternoon—uncrowded, unhurried and the very definition of picturesque! Bookings are available Monday to Sunday all year round.